Have you ever been on the mound and found yourself in a rhythm where your pumping the zone full of strikes and everything seems to be going your way? If pitchers could find this “rhythm” or “zone” more often wouldn’t that be great? Well there are a few things you can do to find your rhythm more often. The first component of finding your rhythm is strike 1. You’ve got to get ahead in the count. It’s hard to find a rhythm if your constantly behind and trying to battle back into an advantageous count. Make it a point before each new batter to focus on the idea of throwing strike 1. The next piece of the puzzle is to work diligently. I don’t want you to think “fast”, but rather “faster’. Be intentional after each pitch-whether it was good or bad- to get the ball back from the catcher, toe the rubber, get your signal and go back to work. I see a lot of young pitchers take way too much time in between each pitch. They get the ball, rub it down, take off their cap and wipe their forehead, walk around behind the mound, or do a variety of other things-and then toe the rubber and start over. It’s always advantageous for a pitcher to control the tempo of the game. It puts the pitcher in the role of aggressor while putting the hitter in a defensive role. Now I should clarify a few things. It’s always a good idea if your struggling to stop, take a breather and refocus. 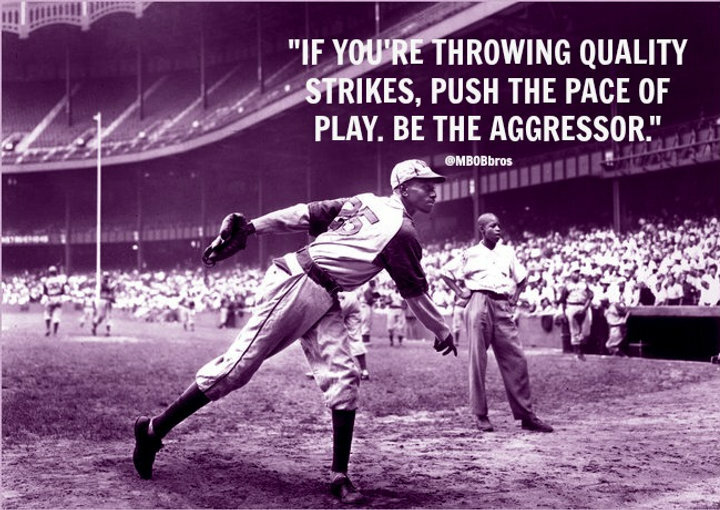 But, if you’re throwing strikes keep the pressure on the hitter and push the pace of play. The other thing I need to clarify is “working too fast”. It is possible for a pitcher to work too fast. I’m not advocating that. If your struggling don’t just keep recklessly stepping on the mound and continue slinging it with bad results. Use your head and find your proper cadence. Don’t be afraid to challenge the hitter. Don’t try to always miss the barrel, just try to miss the sweet spot, especially early in the count. Too many pitchers give hitters too much credit. Keep in mind hitters are trying to hit a round ball with a round bat-and they have less than one second to decide if it’s a good pitch and swing. The advantage is always in the pitcher’s favor. So, pitch to contact and let your defense do the work behind you. When you find yourself in a two strike count go ahead and put the hitter away. There’s no need to take an 0-2 count to a 3-2 count because you nibbled at the corners. Continue to challenge hitters. Don’t give them too much credit. If you’re facing a good hitter and you want to throw an 0-2 breaking ball in the dirt-that’s fine. Just don’t throw 3 in a row like that. Make sure that your breaking ball hits the front of the plate. Don’t bounce it a foot outside and a foot short of the plate. No good hitter will chase that-so why waste a pitch just because? Be aggressive and challenge hitters with a pitch that looks like a strike. If you do happen to go to a 2-2 or 3-2 readjust and throw a strike. The easiest place for you to lose your rhythm is in between innings. Don’t let this happen to you. Keep focus. Separate yourself from the rest of the team. Start visualizing the next inning and the hitters you will face. Have a plan and stay in the moment regardless of what your team is doing offensively. I hope this helps you. Try implementing these ideas into your game. There are a number of things that may help you besides these 5 strategies, so find what works for you. Let us know how it works!